Trusting your instincts and putting in some hard work can turn your entire life around, no matter how dire your current situation is. This is what one Louisiana man learned after going from homelessness to making millions with his company that builds beaches in people’s backyards (1). 33-year-old Eric White didn’t have the best start to life, he dropped out of school in ninth grade with a second-grade reading ability and ended up homeless for eight months at the tender age of 15 (1). White recalled that things were so bad that, “I could hardly even spell my name” (2). Even though he didn’t have the best educational foundation there is one thing, in particular, he understood very well – construction (1). White was adamant that if he could master his construction skills, he’d do well in life. He stated, “I knew if I worked at it, I could really do something with it”, and he was right (2)! White first started his journey into the world of construction by working for a local construction company to pay the bills (1). He later got a job with a Baton Rouge-based company, which is where he obtained the skills he needed to thrive in the construction business (1). White stated that “The guy that I worked for there took me under his wing and taught me about the company. Within the first six months, I was managing the team” (2). White continued to move his way up the ranks in construction, going on to work for another company after the Baton Rouge-based one then eventually starting his own business (2). His first company was called Cool Pools and it was a great success (2). He sold it last year for over a million dollars (2). 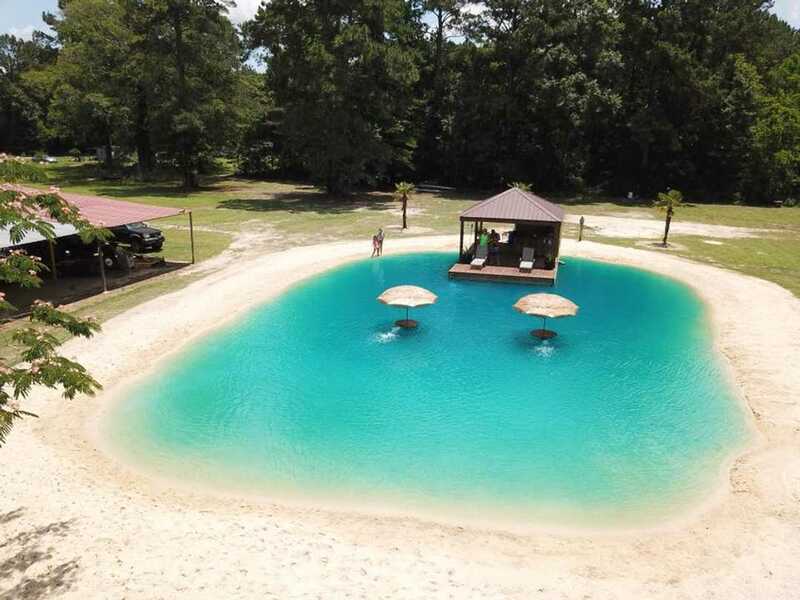 With one successful company under his belt, White founded Zydeco Construction, a South Louisiana company that builds “swimming ponds” with crystal clear blue water and surrounding sand, basically a beach for your backyard (2)! Zydeco Construction also offers in-ground trampolines, customizable outdoor kitchens, patios, decks, concrete driveways, and drainage solutions for floods (2). White decided to start Zydeco to keep himself busy and fulfill his creative visions (2). He explained that “It’s something that for years I would think to myself, ‘What if someone could figure out a way to turn a pond into a paradise?’ I wanted to provide this service and wanted to be the first to do so. I did as much research as I could and applied it to building these ponds.” (2). The dazzling ponds that Zydeco Construction is known for building don’t come cheap, with the average cost coming in at around $20,000 (1). Nevertheless, people who purchase these ponds definitely get their money’s worth, with White describing each pond as being “customized for that area and for the customer” and “a true labor of love” (1). Eric White’s story is one of great triumph, he was able to turn his natural talent for construction into successful businesses through his hard work and dedication. But for the average person, escaping poverty isn’t an easy thing to do and White’s case is an exception to the norm. If you or someone you know is facing homelessness help is out there. Visit https://www.voa.org/homeless-people for information on support services, including emergency shelter’s, drop-in centers, and housing options, and to find an office near you. The post How Eric White Went From Rags to Riches By Pursuing His Passion appeared first on The Hearty Soul.